Could the app economy be the cure for the United States’ employment doldrums? A new report suggests that the nascent app economy spurred on by iOS (s aapl), Android (s goog) and Facebook apps has generated 466,000 jobs in the U.S. economy since 2007. In the report by technology trade group TechNet, Michael Mandel of the South Mountain Economics, who conducted the research, found that 311,000 app-related jobs have been generated and another 155,000 jobs have also been indirectly created from the app boom. The figures are estimates and are based on calculations on the existing market for app-related jobs. Mandel warns that the figures could represent “jobs not lost” rather than net jobs gained. But if the latter is true, it starts to paint a broader picture of the economic benefit from apps, which have only really been around in force for the last four years. We’ve already talked about some of the revenue brought in by apps and where it’s forecast to hit. 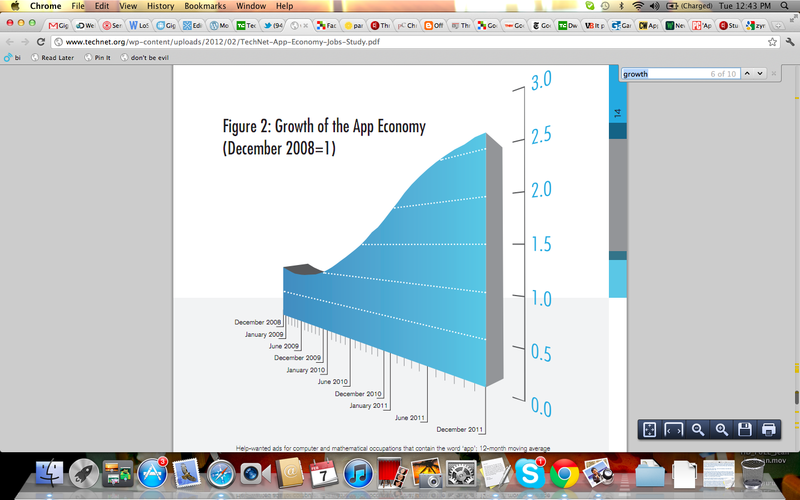 Gartner said last year it expected mobile app stores to generate $15 billion in revenue in 2011. But it’s interesting to see how many actual jobs might be at work in this emerging economy. App jobs can be found in big software and gaming companies like Electronic Arts (s ea) and Zynga (s znga) to small one person start-ups working out of a home. Big companies are also devoting more and more resources to apps, and as apps help companies grow, it fuels the need for more jobs in human resources, sales, marketing and other non-technical positions. There’s also an emerging app development services economy growing out of the app boom. The app economy has been a major engine for job growth in an otherwise sluggish labor market, said Mandel. And it’s likely to keep growing as wireless and social platforms expand. Mandel arrived at his estimates by looking at the number of unique “help wanted” ads for apps in the the Conference Board HWOL database. He then factored in the historical rate in the computer and mathematics industry for employment ads compared to existing jobs. 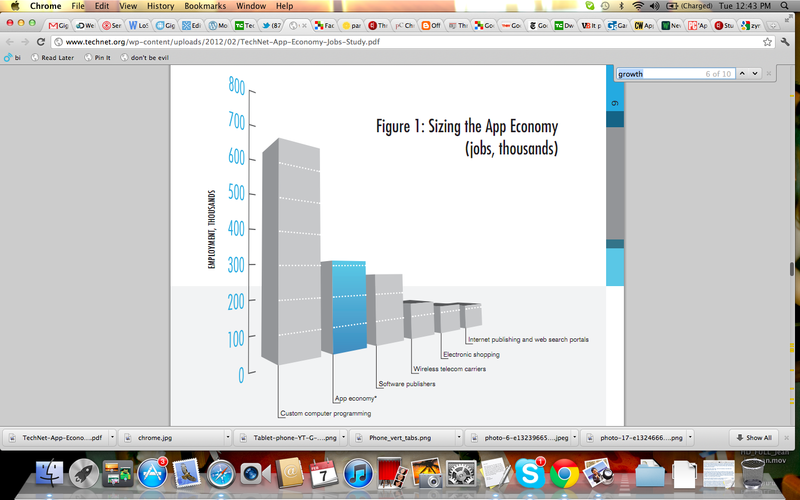 And then he applied a multiplier to estimate the number of indirect jobs created by apps. The highest number of app positions in a metro area were created in the New York-New Jersey-Long Island area (9.2 percent), followed by San Francisco-Oakland-Fremont (8.5 percent), San Jose-Sunnyvale-Santa Clara (6.3 percent) and the Seattle-Tacoma-Bellevue (5.7 percent) area. Overall, California generated the most app jobs by far with 23.8 percent of all jobs, followed by New York (6.9 percent) and Washington (6.4 percent). These are still early days and that’s why Mandel was forced to come up with his own estimates, because there is no good tracking done by the Bureau of Labor Statistics. But I think we’re likely to see a lot more growth, especially as smartphone and tablet penetration increases. As I wrote earlier, consumers are increasingly favoring apps over a browser in part because it’s a pretty streamlined experience that is dedicated to one purpose. Over time, we will likely see the growth in app jobs level off as more companies look to leverage the web and build more cross-platform HTML5 web apps. But for now, there’s still a lot of interest in native apps that are built atop popular platforms. And that means this is where to find a lot of new jobs.